Witnessing this female Triorla interrupta take this young male Common Whitetail right out of the air was an amazing sight - it simply pulled him right out of the air, and after a minute or so of bouncing and buzzing about in the grass, she was sucking him dry. Dragonflies are certainly vicious predators, but they're are no match for these beautiful robber flies. 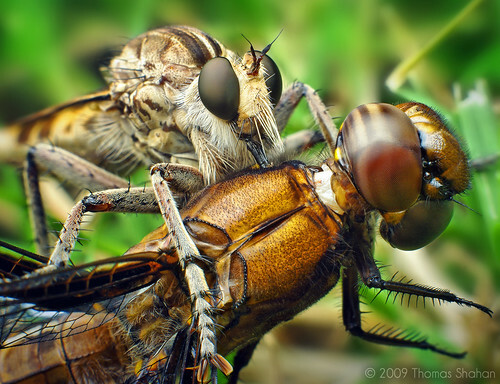 From what I've read, these Triorla robbers are absolute beasts that regularly take down prey much larger than themselves - grasshoppers, katydids, dragonflies, and of course - other robber flies. Maybe I'm exaggerating, but I've seen darker hairier robber flies around this same spot at least twice the size of this female T. interrupta! I never managed to get a good photo of the one specimen I encountered last summer, but got a good enough look to be certain it was a robber. As it would transfer from perch to perch, it would swoop down and buzz right by my head, coming within inches of my face - I've never witnessed anything like that. Maybe next summer I can get some shots of one of those monsters in action! I took this photo last July - and maybe my memory is awful or I was just too excited about the scene, but I really can't remember exactly how I took the shot above - I think I was just using my old Asahi Pentax 50mm f/1.4 prime reversed directly to the body... regardless - it's a manual focus stack of 3 shots.